I love how Stormy looks like she is wearing a white bib. She is like half an oreo cookie! 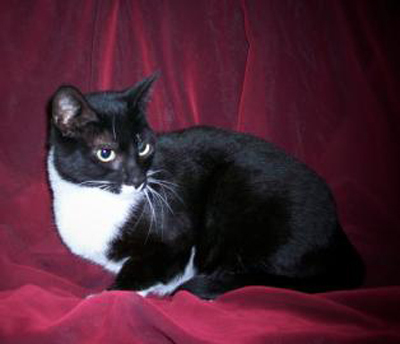 Stormy, a 1.5-year-old black and white female cat, needs a change of luck! She is at our adoption location at The Mall at Greece Ridge! This sweet girl was brought to Lollypop in April because her owner was having problems, then she was adopted only to have her new owner pass away in July. She is confused and lonely, and eagerly awaits her new forever home. She gets along well with other cats and children of all ages. She’s a bit shy at first, but once she gets to know you she transforms into a lap cat. Stormy will purr softly and roll onto her back to show off her white stomach. Feather toys are one of her favorites! This is a beautiful sweet cat, well worth the initial effort to get to know her. Come out and adopt Stormy at The Mall at Greece Ridge, store number 356 near mall entrance number 6! Visit http://bit.ly/LollypopMGR to see location hours.What are you waiting for? Precious, the dog from last week, is still waiting to find her forever home.